We don't have any trips to South Korea at the moment . 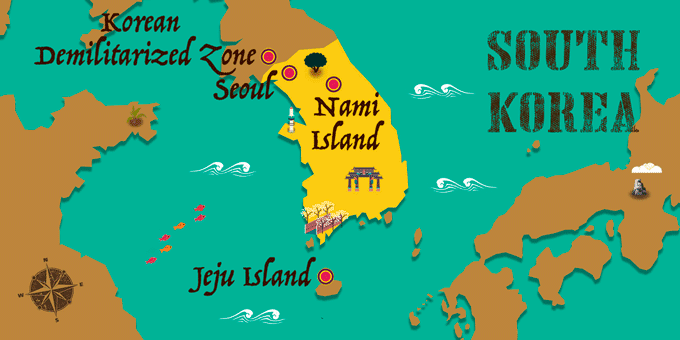 Located on the far eastern edge of the Asian mainland, South Korea is composed of the southern part of the Korean peninsula and shares a border with North Korea, whilst being separated from China to the west by the Yellow Sea and conveniently situated just a short ferry ride away from Japan to the east. With a population of 48.8 million people, the nation of South Korea is a very homogenous country with almost all inhabitants identifying as ethnically Korean. The immediate thoughts that spring to mind when imagining the country are that of ultra-modern skyscrapers, high-tech gadgets, and a non-stop lifestyle, and although this is true for its urban hubs, the country’s ancient traditions are kept alive in the countryside, so a holiday to South Korea is sure to be an experience of contrasts. A large number of well-preserved palaces and fortresses from the era of Korea’s dynasties can be found across the country, such as the epic Namhansanseong Fortress, showing that despite the urban sprawl so characteristic of the country, elements of ancient beauty have been retained. On the other hand, the extreme modernity of its capital, Seoul is visually and sensually striking. It’s a leading financial center, densely populated and known for its K-Pop culture, the high-tech subway system and its epic skyscrapers and modern architecture, such as the futuristic Dongdaemun Design Plaza. Other major cities include the port city of Busan and the ancient spiritual capital of the Joseon Dynasty, Jeonju. One of the world’s most off-the-radar tourist destinations, South Korea is a dream destination for the intrepid traveler. Since the partition with North Korea in 1948, the country has become one of the most affluent nations in Asia. A tour of South Korea is sure to be a whirlwind to the senses, a cultural eye-opener and an exciting glimpse into a lesser-known country. In the early years of South Korean history, several competing kingdoms were unified together on the Korean peninsula, ruled over by numerous dynasties for more than a thousand years, the last of which, the famous Joseon Dynasty, endured for an exceptionally long period, its reign stretching from 1392 to 1910. During this period, Korea had limited contact with outside nations, a strategy that was established in order to avoid conflict. In the late 19th century outside western powers such as the United States and Britain made a number of efforts to open trade with Korea, aware of its rich resources and well-placed location. What followed was the colonization of the Korean peninsula by the Japanese Empire who were eager to force their language and culture on to the local populations. They also increased industrialization in the country and during World War II many Korean men fought on the side of the Japanese against the Allied powers. his division led to the turbulent Korean War, which cost approximately 2 million lives and resulted in the establishment of a Demilitarised Zone between the two nations after the conflict ended in 1953. Since this pivotal turning point, and despite unrest, uprisings, and dissatisfaction from sections of the population over the following years, South Korea has focused itself on becoming an affluent, high-tech country, famously hosting 1988 Seoul Olympics and adopting the famous ‘Sunshine Policy’ towards its northern neighbor. Kim Dae Jung, who proposed this policy, was awarded the Nobel Peace Prize in 2000 for its successful implementation and the resulting improvement in relationships with North Korea. If you’ve always been fascinating by the politics and history of the Korean peninsula, a tour of South Korea offers you the opportunity to get up close to the living history of the region. South Korea has a distinct cultural identity due to a number of reasons such as the homogenous nature of its populations, isolationist policies and mountainous nature of its terrain. The language and cuisine of South Korea set it apart from other Asian nations for its unique delicacies and a language so distinct that it shares no relationship with any other language family. A trip to South Korea will give you the opportunities to engage with a culture quite unlike anything you’ll find elsewhere in the world. Under the long-lived Joseon Dynasty, the philosophy of Neo-Confucianism was dominant and values such as the paramount importance of education and the value placed on hard work still endure today. Perhaps the country’s most famous cultural export is it's energetic K-Pop music, recently gaining global attention for its catchy hits. A rich television and film culture is also present in South Korea and locally produced K-Dramas are more popular there than any Hollywood imports. A package holiday to South Korea is the perfect way to soak up the exuberant and fresh culture of this little known Asian treasure. With a mostly mountainous terrain, many of South Korea’s most visited destinations focus on the urban centers, often situated between the great mountains that characterize the country. Despite this, South Korea does, in fact, possess a fantastic natural environment if you are prepared to venture off of the beaten track and away from the sprawling metropolis of Seoul, the starting point for most tours of South Korea. Around 3,000 tiny and largely uninhabited islands are dotted around the country’s coastline and their untouched environments are home to some of the best biodiversity in South Korea. The largest of which is Jeju Island, a UNESCO Natural World Heritage Site known for its volcanic landscape of craters and lava tubes and the dormant volcano, Hallasan Mountain. Locals often visit the island to enjoy the beach resorts of its coastline. The atmospheric Seoranksan National Park is another unmissable natural attraction, with mist-covered mountainous peaks, hot springs, dense forest, unique rock formations and a number of ancient temples, which give the area a distinctly spiritual feel. The national park has a number of well-marked hiking trails and is the perfect place to fall in love with an alternative South Korean experience. Despite a generally humid and subtropical climate, with very hot summer temperatures, the winters in South Korea can be exceptionally cold, due to Siberian winds, and snowfall is common. Ski resorts such as Pyeongchang in the Taebaek Mountains offer fantastic skiing amenities and make a holiday to South Korea in the winter an exciting prospect. It was here that the 2018 Winter Olympics took place, and where both North and South Korean athletes famously marched under the same flag. A remarkable holiday destination, South Korea is a world of opportunities for intrepid travelers willing to venture on the road less traveled. Conveniently situated close to the more popular Japan, South Korea invites you to be thrilled by the technology of modern Seoul, trace the timeline of history through its ancient temples and demilitarised zone, and seek spectacular views from its atmospheric highlands. A tour of South Korea invites you to give in to your curiosity and discover it for yourself. Passport must be valid at time of entry. No visa required for stays less than 90 days for tourism or business. Carry some form of identification at all times. If South Korea has caught your attention, leave us your number so we can call you to discuss the voyage that awaits you.